Cost: You can make around £50 as a free member, then it’s £99 for the year of £14/month if you choose to pay monthly. Quick Summary: If you want to earn (a lot) more online than paid surveys but don’t want the hassle of starting a full-blown online business then MatchedBets sounds like the answer. 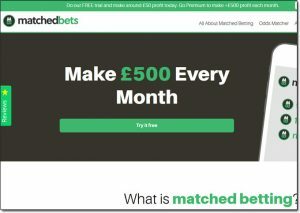 Launched in 2016 MatchedBets is a relatively new matched betting service that provides people with an easy way to make risk-free cash by exploiting the bookmakers free-bet offers. It’s totally legal, totally legit & can provide a great way to earn a lot of easy extra cash. There’s an option to join for free which will enable you to make around £50 in profit and you can take things to the next level by becoming a premium member where you’ll unlock the ability to earn around £500 (or more) each month. It’s safe to say that if you live in the UK then matched betting (with the help of sites like MatchedBets) can provide one of the easiest ways to make a substantial amount of cash in your spare time from home. How Exactly Does Matched Betting Work? The important thing to take note of is that matched betting is not gambling because there is no risk involved. To put it simply, matched betting is a process in which you cover all outcomes of a bet so that you can “beat the bookmakers” and turn their free-bet offers into withdrawable cash. The concept of matched betting is not new, but prior to the launch of websites like MatchedBets you would have had to use spreadsheets & complex formulas to have been able to successfully profit. Now, thanks to sites like MatchedBets everything has been done for you meaning you can simply follow their step-by-step instructions and put yourself straight into profit quickly & easily. If you’d like to learn more about the exact workings of matched betting you can do so by reading my dedicated blog post or by watching this video on the homepage of the MatchedBets website. As mentioned above, MatchedBets is basically a website that takes the hardship out of matched betting. It’s really newbie-friendly as you’re taken through a whole bunch of training steps that explain the process in a way that’s really easy to understand (and if you’re already a whiz, don’t worry as these steps are optional). You’ll be shown a ~2 minute welcome video explaining exactly how matched betting works. You’ll then learn the basic principles of matched betting & what you need to get started. And finally you’ll be shown your initial matched-betting offers & how much money you can make from each one. For somebody brand new I would say the getting started process (done properly) would take around 15 to 30 minutes to complete, but as mentioned above if you’re already a whiz you can skip straight through the training & jump straight to the offers to start making money right away. As soon as you create your account with MatchedBets whether it be free or premium you can literally begin making money right away. You’ll be presented with 3 “easy to claim” offers that will help you start building your bank so that you can move onto the bigger, more profitable offers as you begin to find your feet. From your dashboard inside the members area you can quickly see the offers along with the type of the offer, who each offer is with & most importantly how much profit you will make by completing the offer. All you need to do to get started with any particular offer is hit the “Show Instructions” button. This will take you a new page where you’ll literally be shown step-by-step exactly how you can claim the offer & how you can profit from the free-bet bonus. To make things even easier you’ll be provided with both a video & a set of written instructions for each of the available offers. This means that even if you’re not totally tech-savvy or haven’t yet fully got your head around the concept you can still profit simply by copying the exact actions shown in the videos. The real benefit with MatchedBets is that you’re given access to their Oddsmatcher tool which provides you with a quick way to find the bets that will be most profitable for the particular offer that you have chosen. As you can see from the image above the bets are listed in order of SNR, with SNR being the percentage that you’d get back from the free-bet offer. This tool really helps to speed up the whole process. Then, once you are done with a particular offer all you need to do is literally hit the “Done” button & you’ll be immediately presented with a new recommendation for you to take advantage of. And another bonus is that MatchedBets.com makes it really easy for you to manage & keep track of all your offers as you can see an overview directly from your dashboard. You’ll be able to see which offers are still open, which ones have been completed & how much profit you have made so far. This is a seemingly simple feature that as a newcomer you might not fully appreciate, but once you get into the swing of things you’ll realise it’s a godsend because keeping track of your matched bets can end up being one of the biggest challenges you’ll face as an experienced matched-better. The past couple of years have seen the rise of matched betting and more and more people are getting involved every day. There’s no denying that it’s a fantastic way to make money and it also provides an opportunity to earn a LOT of money too… But the question is, which website should you choose? You can join MatchedBets for free & begin making money right away, but even the price of their premium membership (which enables you to earn over £500 per month) is lower than that of nearly all of their rivals. And don’t think that being cheaper means you get less because in the case of MatchedBets it’s probably the opposite way around. MatchedBets boasts a whole bunch of cool features that other matched-betting sites don’t have & I feel that MatchedBets is also constantly pushing to deliver innovative new features. MatchedBets does make matched betting easy but they also seem to understand that for many newcomers it can seem quite daunting until they get to find their feet (I know, because I too felt the same way). 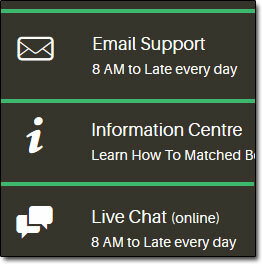 However, the great thing about MatchedBets is that you’re given access to support whenever & wherever you need it and you can usually get an answer in a matter of moments. They offer email support & live chat from 8am until late and also have a forum where you can get help from other members in the community too. Basically unlike some of the websites out there at MatchedBets you’re never left to “go it alone” – help’s always there when you need it and generally it’s provided very quickly too. Don’t get me wrong I’ve seen some other fantastic matched betting websites, but out of them all I think it’s safe to say that MatchedBets is at the forefront when it comes to delivering innovative new tools & methods to help people make larger and easier profits. As mentioned earlier in the review they have a really handy tool named Oddsmatcher & they have also recently just launched an exciting new tool named AccaBacker too (which I’ll most likely be writing about shortly – it looks great!). Simple website & easy to follow process. Whilst the other things mentioned above are definitely great additions I think one of the most important things a matched betting website needs to have is a simple website & easy to follow process, because let’s face it – without those 2 things matched betting can be pretty confusing (and time consuming). Thankfully MatchedBets have nailed it. Their website is really easy to use & they’ve ran with a totally step-by-step process meaning you’d struggle to go wrong even if you tried. With MatchedBets I’d be confident in saying that even as a complete newcomer to matched betting you could literally sign up & be on your way to profiting in just 15 to 30 minutes. Free Membership (Trial) – try out MatchedBets.com as a free member & you can make around £50 of profit. 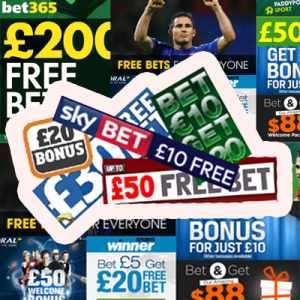 Whilst you can access the service for free, a stake may be required to redeem the free-bet offer. Premium Membership – once your free trial is up (after you’ve made around £50) you’ll need to upgrade to a premium membership if you want to continue making profits. If you pay annually this will cost you £99 per year (cheapest option) or you can pay by the month at £14 per month. If you do decide to join I’ve recommend paying annually as that will save you £69 over the course of the year. 50 Points = Lifetime Premium Membership! Premium VS Free Membership – Which Is Better? Whilst you can dip your toes with the free membership & make a little bit of money to see for yourself that it really works, ultimately if you want to make any sizeable profits you’re going to have to upgrade and become a premium member – but don’t let the pricing put you offer, premium membership is well worth it. I appreciate that £99 per year can sound like quite a lot of money but if you break it down that’s less than £9 per month which is a tiny sum compared to the profits that you’ll be able be make. As a premium member you’ll be provided with enough offers to make over £500 per month & since the income is tax-free that means you’ll be in profit by well over £400 per month even after you’ve paid your membership fees. Basically, over the course of a year you can very easily make more than the annual fee. You’ll also get access to a bunch of additional tools, features & support as a premium member which will help you take your profits to the next level & make the process a lot more streamlined. Personally I think MatchedBets is a great website & it provides a great way for people who are looking to make a lot of money with little effort or commitment. Initially it’ll probably eat up some of your time but once you get used to the process you’ll be able make quick & easy money in a matter of minutes. MatchedBets is definitely one of the more cheaper matched betting sites out there but that doesn’t mean they’ve cut back on quality. They provide an excellent easy to follow service & the website is packed with great tools to make the process much easier and much quicker. 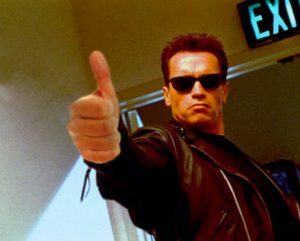 So it’s safe to say that MatchedBets get a massive thumbs up from me & if you reside in the UK I highly recommend you give it a try. This is definitely one of the best money-makers I’ve came across to date. Click Here Now To Join MatchedBets.com Free & Make Up To £50!